Scientists just figured out how to map out clusters of dark matter in high detail. To give you an idea of how crazy that is, it’s key to remember dark matter is an invisible material in space. No one has ever observed it before because it doesn’t emit light or energy. In a study published Tuesday in Monthly Notices of the Royal Astronomical Society, a Yale-led team of researchers produced one of the highest-resolution maps of dark matter ever made. “It was pretty amazing to just see this three-dimensional version and to see what the landscape looks like, and to see this whole landscape was pretty astounding,” Yale astrophysicist Priyamvada Natarajan, tells Inverse. Dark matter can’t reflect or absorb light, but it can exert gravity. Using the Hubble Space Telescope Frontier Fields data, scientists created a map with the help of a method called gravitational lensing. In other words, they used galaxy clusters as a cosmic lens to observe the more distant parts of our universe. Studying distant objects in the universe is like looking back in time, since light can take years to travel large distances. Scientists believe they’re able to use galaxy clusters as a lens because dark matter particles are bending light from distant galaxies. All matter in the universe deflects the path of light rays, so the researchers inferred how to map the dark matter by analyzing the way light was deflected and figuring out how much matter there is. Researchers also inferred that the dark matter was clustering together. While particles of cold dark matter tend to accumulate into clumps, hot dark matter doesn’t clump together as easily. Using Hubble Space Telescope Frontier Fields data, Scientists created a 3D visualization of reconstructed dark matter clump distributions in a distant galaxy cluster. The peaks show how cold dark matter clumps together. This map is expected to be useful in helping scientists better understand the universe. 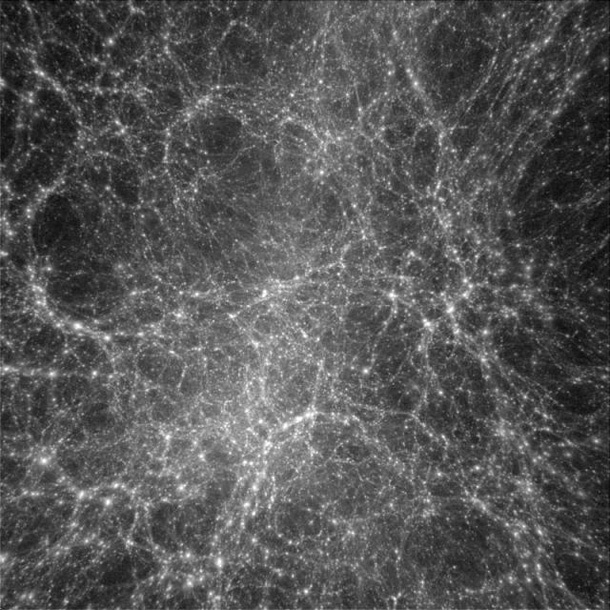 Dark matter, which makes up 27 percent of the universe and 80 percent of all the universe’s matter, may be able to explain how galaxies form and how the universe is structured. According to previous simulations of dark matter predicted by the cold dark matter model, cold dark matter is more sluggish, as it moves slowly compared to the speed of light, while hot dark matter moves faster. The new map agrees with the model of the currently accepted theory, although so far all the clues we have about dark matter is indirect evidence. Even though scientists have figured out how to map dark matter, they still don’t know what it’s made of. Meanwhile, Natarajan’s team plans to continue doing comparisons and to push the limits of the current theory about dark matter to see how robust it is. Abstract: We map the lensing-inferred substructure in the first three clusters observed by the Hubble Space Telescope Frontier Fields Initiative (HSTFF): Abell 2744 (z = 0.308), MACSJ 0416, (z = 0.396) and MACSJ 1149 (z = 0.543). Statistically resolving dark-matter subhaloes down to ∼109.5 M⊙, we compare the derived subhalo mass functions (SHMFs) to theoretical predictions from analytical models and with numerical simulations in a Lambda Cold Dark Matter (LCDM) cosmology. Mimicking our observational cluster member selection criteria in the HSTFF, we report excellent agreement in both amplitude and shape of the SHMF over four decades in subhalo mass (109 − 13 M⊙). Projection effects do not appear to introduce significant errors in the determination of SHMFs from simulations. We do not find evidence for a substructure crisis, analogous to the missing satellite problem in the Local Group, on cluster scales, but rather excellent agreement of the count-matched HSTFF SHMF down to Msubhalo/Mhalo ∼ 10−5. However, we do find discrepancies in the radial distribution of sub haloes inferred from HSTFF cluster lenses compared to determinations from simulated clusters. This suggests that although the selected simulated clusters match the HSTFF sample in mass, they do not adequately capture the dynamical properties and complex merging morphologies of these observed cluster lenses. Therefore, HSTFF clusters are likely observed in a transient evolutionary stage that is presently insufficiently sampled in cosmological simulations. The abundance and mass function of dark matter substructure in cluster lenses continues to offer an important test of the LCDM paradigm, and at present we find no tension between model predictions and observations.